Three fish may be weighed-in per day but only one can be over 22 inches. All 3 may be under 22 inches. Fish must be brought to the weigh-in site in good condition. Winners will be determined by accumulation of the heaviest Walleyes caught throughout the tournament, not to exceed 6 Walleyes. Only 3 walleyes may be recorded each day, per contestant. In case of a tie, the length will determine the winner. In case of another tie, the time the fish was weighed-in will be the next tie breaker. Daily prizes for Pike and Perch will be determined by the heaviest fish caught of each species, with the same tie breaker as mentioned above. Only one prize per entrant, per day. 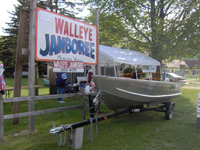 ALL PERSONS IN THE BOAT MUST BE REGISTERED IN THE JAMBOREE! You may be asked to show proof of registration on the lake, at weigh-in and at the Awards Dinner. Everyone will be issued a card as proof of registration. Keep this card on you at all times during the tournament and bring it to the Awards Dinner. Anyone not abiding by these rules will be disqualified. NO REFUNDS GIVEN! Final decisions will be up to the judges. Anyone who brings in a fish tampered with will be disqualified. Fisherman in the contest must observe a Michigan Fishing Regulations and good sportsmanship. No restrictions on legal bait. Sorry, Amateurs Only! NO PROFESSIONALS OR GUIDES! The contest will begin at 5:00 a.m., May 26th, and will end promptly at 3:00 p.m. on May 27th. All entrants MUST be registered by May 25th at the fisherman’s meeting. This meeting starts at 6:00 p.m. at Kim’s Tally Ho, Curtis, MI. Weigh-in times are 10:00 a.m. to 12:00 a.m. and 6:00 p.m. to 11:00 p.m. on Saturday May 26th and 11:00 a.m. to 3:00 p.m. on Sunday May 27th. The weigh-in site is at Watson’s Marina. All persons in the weigh-in area with fish when weigh-in closes will have their fish weighed in and entered. The weigh-in area will close promptly at 12:00 p.m. and 11:00 p.m. on Saturday and 3:00 p.m. on Sunday. NO EXCEPTIONS! Daily prizes will be awarded at the Awards Dinner, along with all the rest of the prizes. A barbecue chicken dinner will be provided FREE to all of the contestants at the Curtis Community Building. A fee of $10.00 for adults and $5.00 for children will be charged for non-entrants and they will be entered into the door prize drawing. Please indicate on your registration form how many non-entrants will be at the dinner with you. Call 906.586-9731 with any questions. Any child entering the children’s contest is not eligible for the grand prize. Must be 14 years old or younger to enter. Entry fee is $10.00 per child. All children entered will receive a prize.